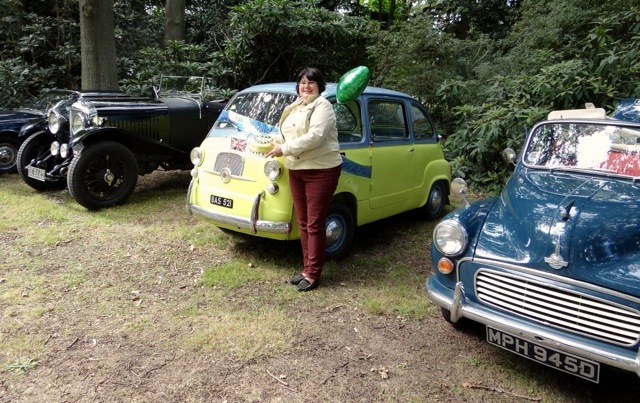 Mario was ‘born’ in Rome in November 1962, and so to take advantage of the ‘Summer’ Mario had an official birthday on Bank Holiday Monday August 27th and invited along a selection of his car friends and their humans to celebrate. 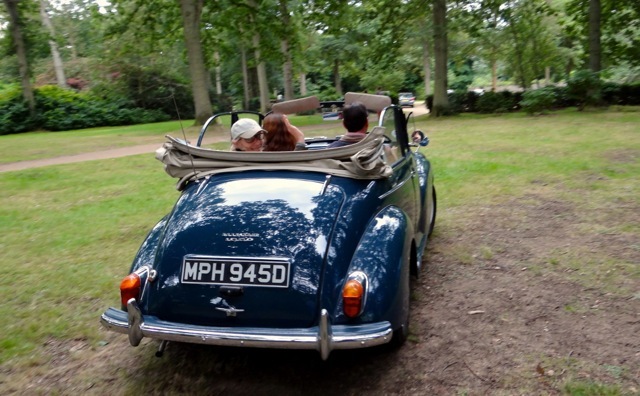 We met up in Haslemere and set off individually on a treasure hunt devised by James. 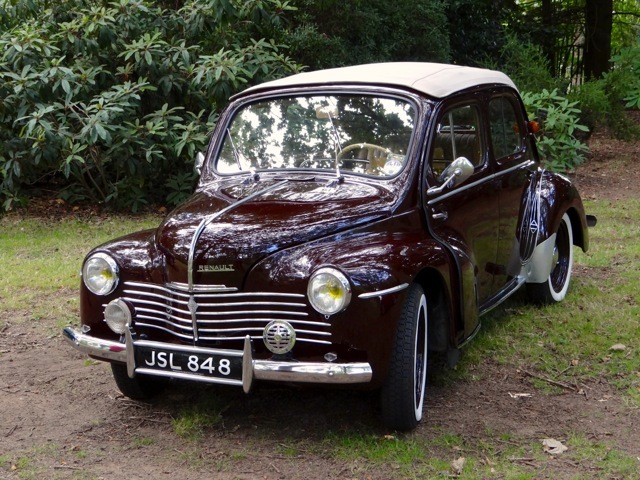 The 20 odd mile route through Hindhead, Tilford, Witley and Hambledon took us along small and twisty roads looking for answers to James’ cryptic questions. 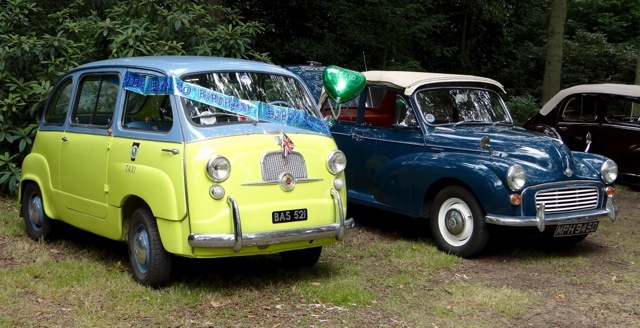 We finished at the Winkworth Arboretum near Godalming, the National Trust were great and let us park up in their picnic area where we created an unusual display for their visitors. Everybody had brought along some food and soon the table was groaning with delicious picnic fare. 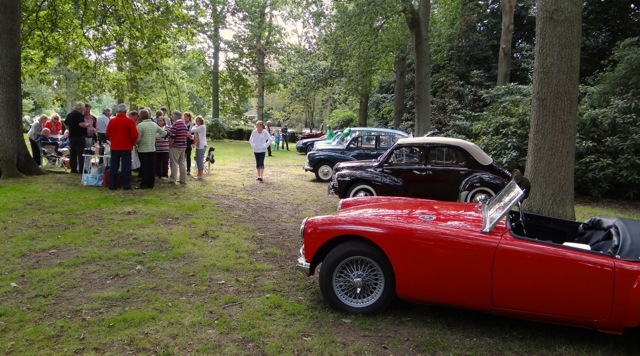 Despite the terrible weather forecast the sun came out and everybody had a very relaxing afternoon. 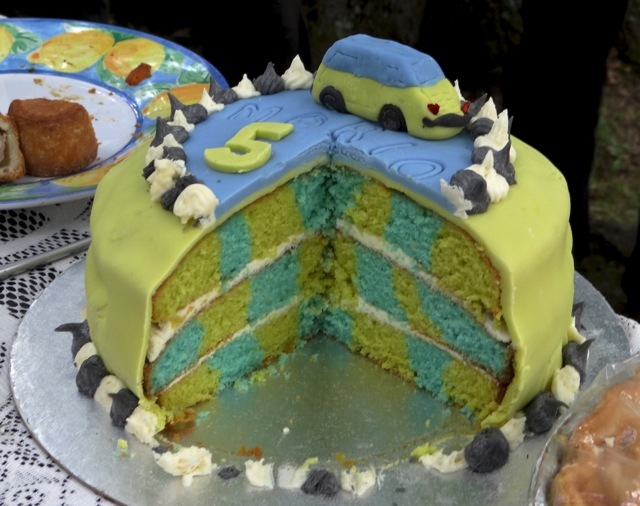 Mario’s cake was cut revealing a surprising Mario coloured checkered inside. 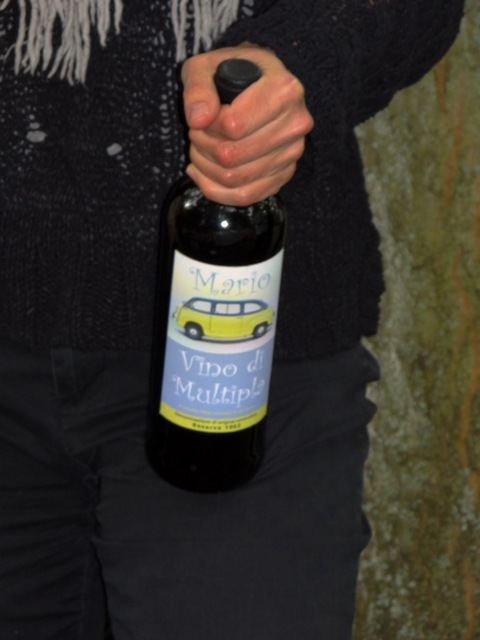 Louise and Peter in the Bentley won a special bottle of Vino di Multipla for their efforts in the treasure hunt. 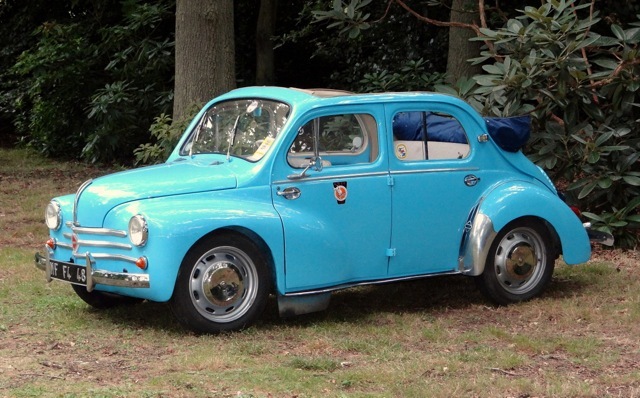 Alongside Mario and his ‘brother’ Regie the Renault was René another 4cv convertible, BlueBelle the Morris Minor Convertible, a Bentley, Facel Vega, MGA and a Stanley Steamer. 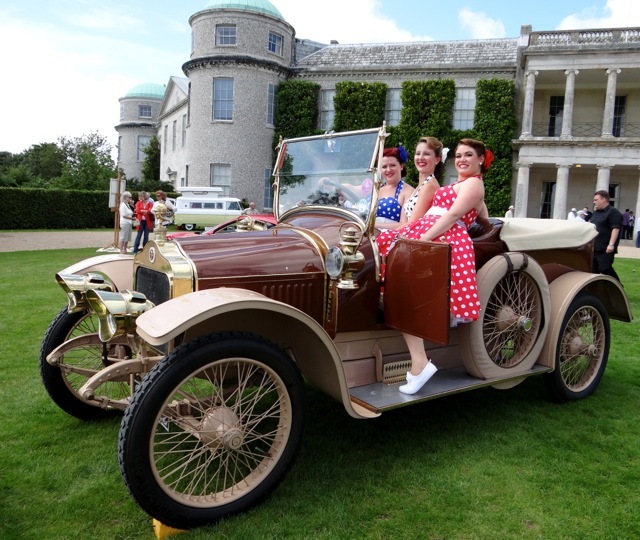 Mario had a lovely day and intends to carry on celebrating his half century throughout the forthcoming Goodwood Revival. 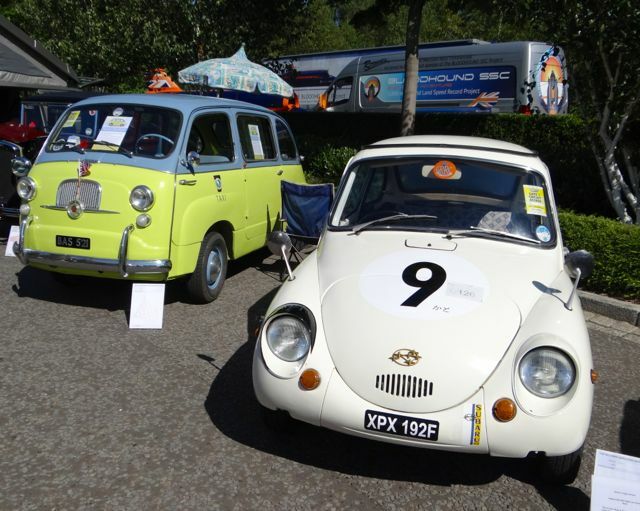 Last saturday Mario (along with his friend Kato the Subaru 360) was invited to take part in the McLaren Employees Motorshow. 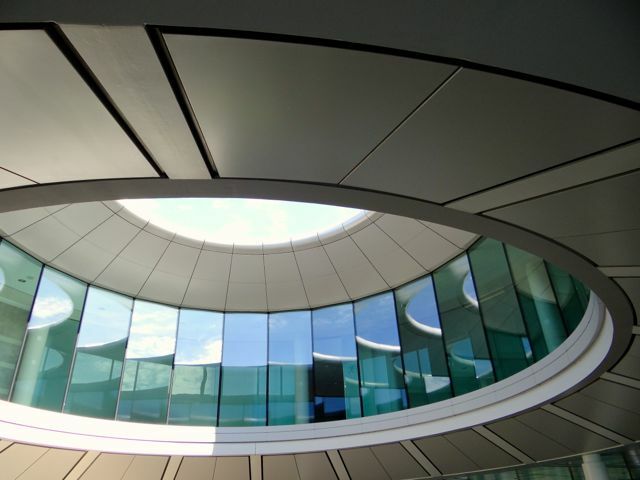 The day at the spectacular McLaren Technology Centre near Woking was held during the F1 season summer break and was an excuse for staff to show off their interesting cars and specially invited others, to their family and friends and raise some money for Help for Heroes. 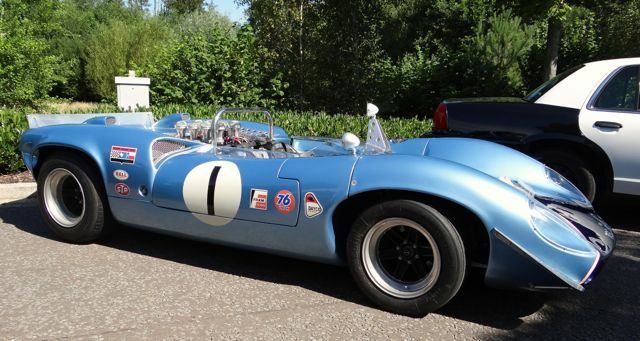 There was quite an interesting collection of cars including hotrods and americana, race machinery, including one guys collection of Lola’s, bikes and classics plus some modern sports cars, a smattering of McLarens road cars and even a couple of powerboats. 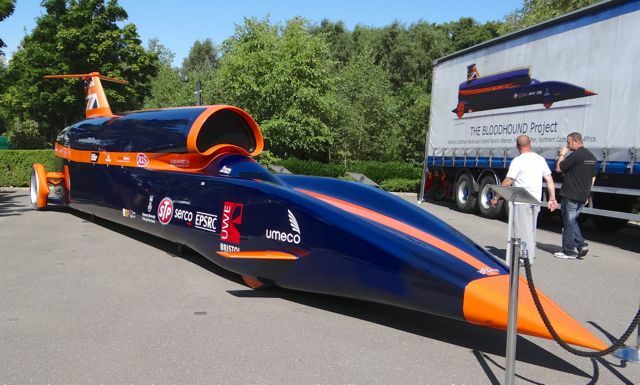 The Bloodhound Land Speed Record team were also their with their mock up of the vehicle due to attempt the 1000mph on land challenge. 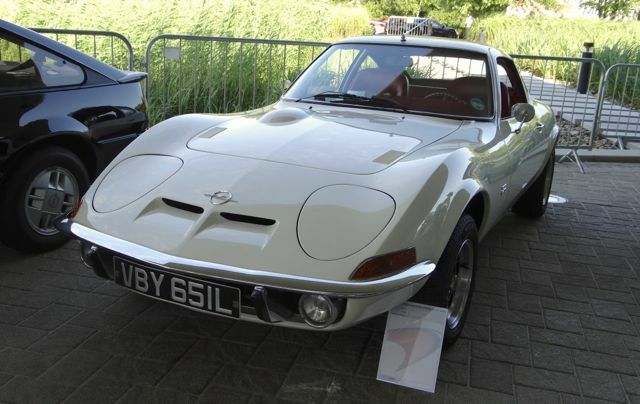 Mario’s humans were especially keen on a couple of lovely Opals, the Manta would be a lovely everyday practical classic. We were allowed in the Technology Centre to see the collection of McLaren race cars and the very impressive display of trophies although you wouldn’t want a lot of them on your mantlepiece, for something that is given as a prize for winning a significant world event some of them are very tacky looking and the use of sponsors logo’s as awards should definitely be banned – the Santander ‘flame’ trophies look especially poor! We thought that we should keep quiet about Mario’s ‘relationship’ with Adrian Newey – ex McLaren designer and now at arch enemy Red Bull, funnily enough there didn’t seem to be any sign of the energy drink as refreshments! 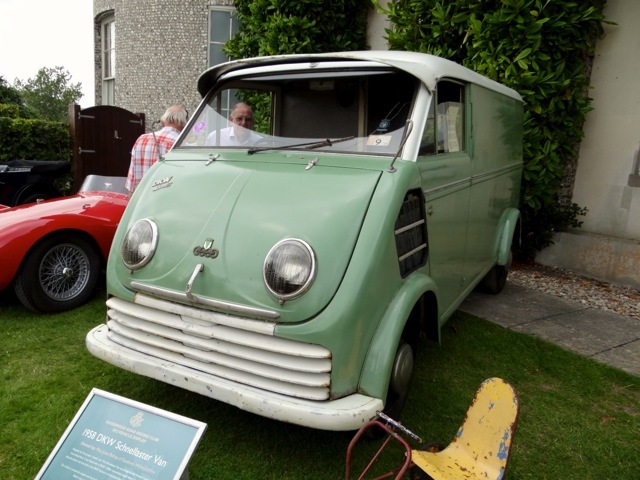 drain who we often see at the Goodwood Revival has always expressed his appreciation of the Multipla’s innovative design for it’s time. Unfortunately there was no photography allowed inside the centre. You could see some of the workshop areas behind glass walls and they were completely pristine as was the whole of the building, McLaren are renowned for their precision and attention to detail which was certainly apparent wherever you looked down to the pens in the meeting room all being placed at exactly the same angle at every place. 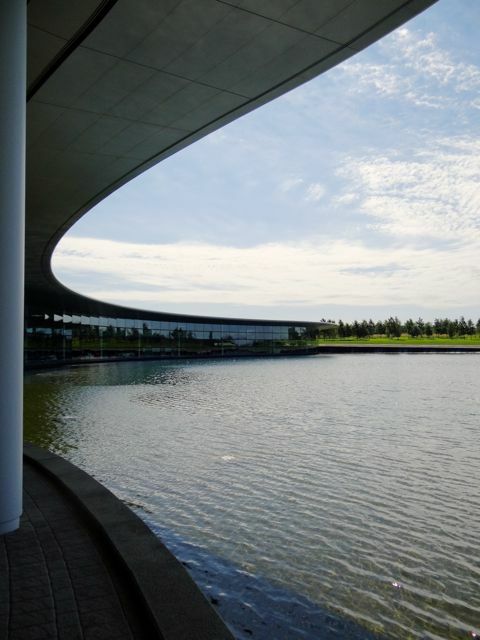 The actual building is very beautiful being long and low, constructed of glass and situated on the edge of an infinity lake, the surroundings are very natural with lots of wild planting. Mario and Kato as always attracted a lot of attention. However it was the hottest day of the year and was rather a long and tiering day as we had to be there by 8.30 am and couldn’t leave until after 5pm. 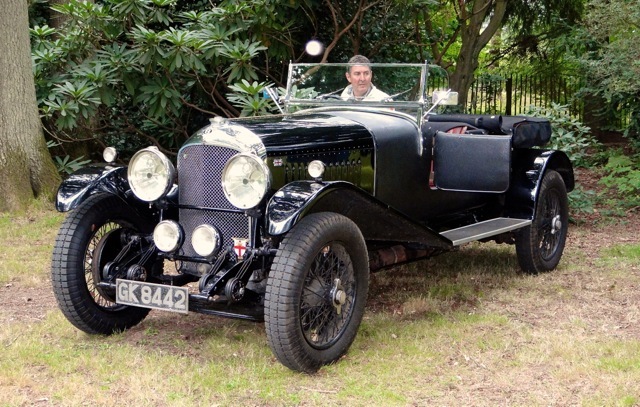 Mario went rather well and seemed to enjoy his ‘blast’ up and down the A3 having to be reined in at times from going too fast, he even overtook at one point but it was a Austin 7! 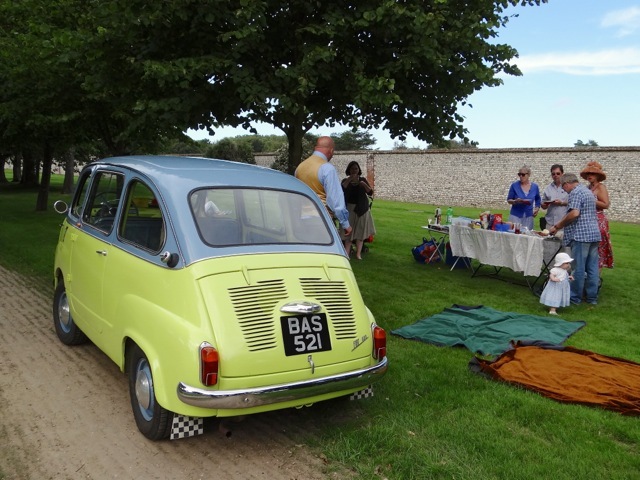 After a few weeks of bad weather and Mario being a little poorly we were determined to go to the Goodwood Breakfast Club yesterday. 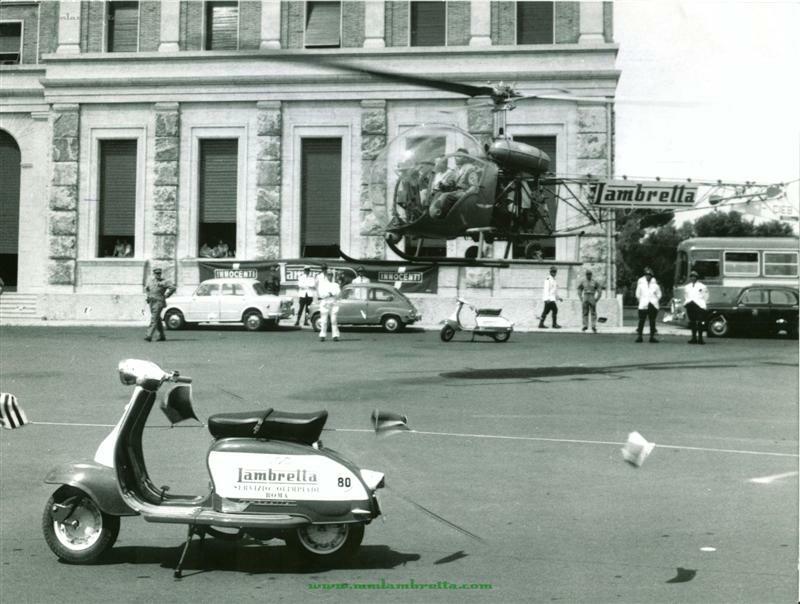 Although we woke up to rain the forecast was for it to improve and for once they were right. 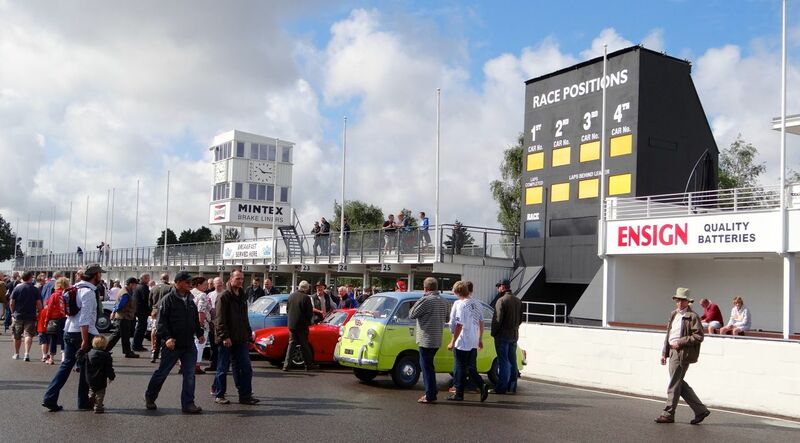 We had a lovely drive down the A286 to Singleton and then up past the race course. 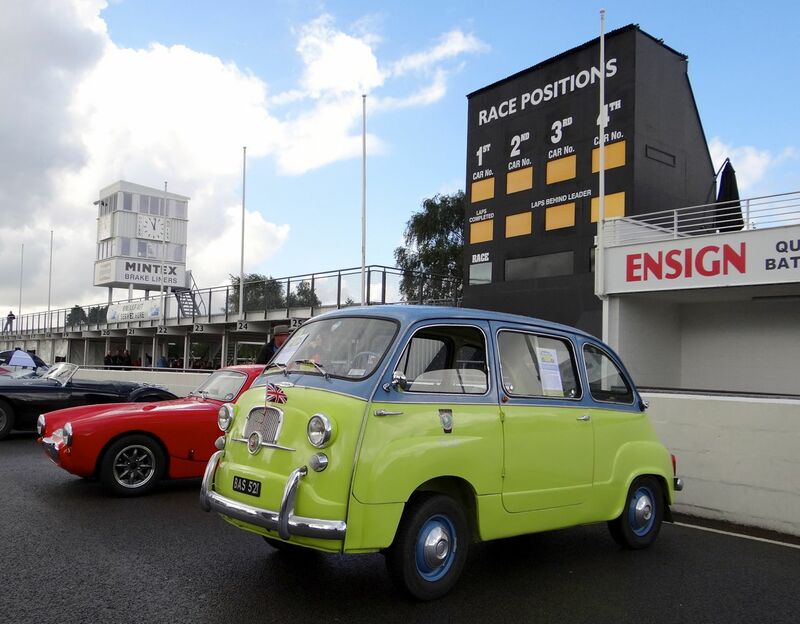 For once there didn’t seem to be any queuing to get in and we were directed straight onto the track and told to park in pole position at the end of the pit lane. 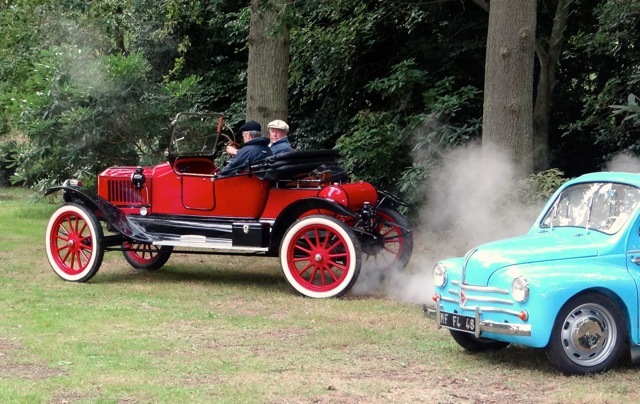 Mario had a taster of what’s to come at the Revival, now less than 6 weeks away with an immediate crowd of admirers. 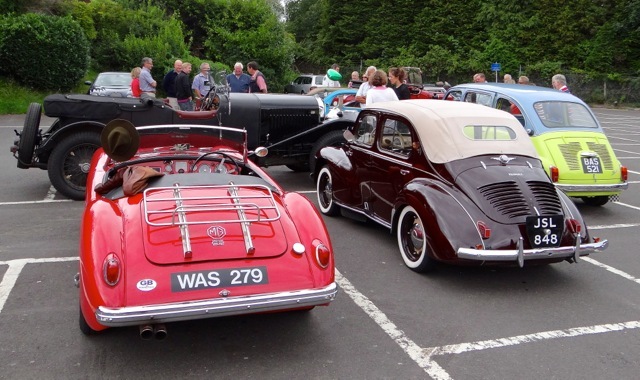 It was good to meet some of his followers on this blog and his facebook page, and sign up a few more – Mario now has 80 ‘likes’ on Fb it would be great to get to 100 by the Revival! 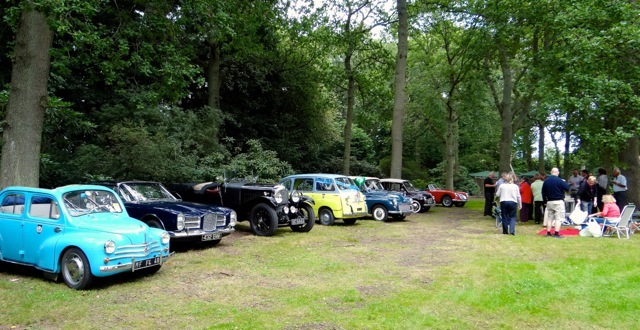 While Mario sat and basked in the attention the humans had a wander around, as this was the pre-revival breakfast club with a pre-1966 theme there didn’t seem to be as many classics there as usual, maybe the bad forecast combined with holidays and the olympics put some off? 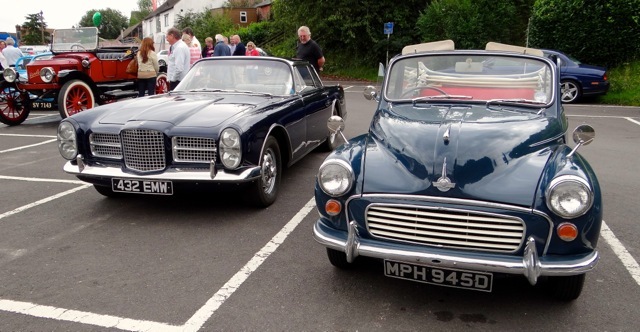 We met up with several friends car and human and spent a pleasant couple of hours before setting off from home. 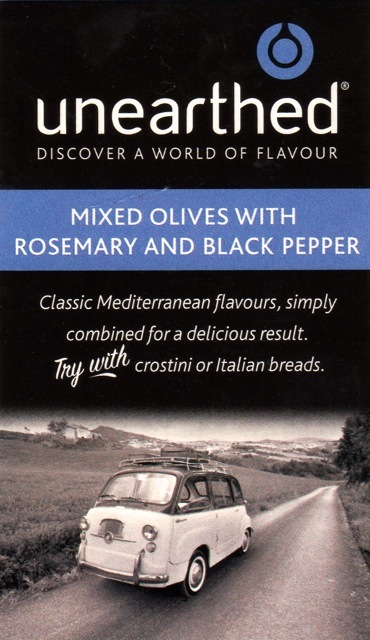 Another good drive just marred by an idiot in a Audi A5 who objected to Mario’s rather slow uphill speed and proceeded to overtake on double white lines and then stick his fingers up – charming. 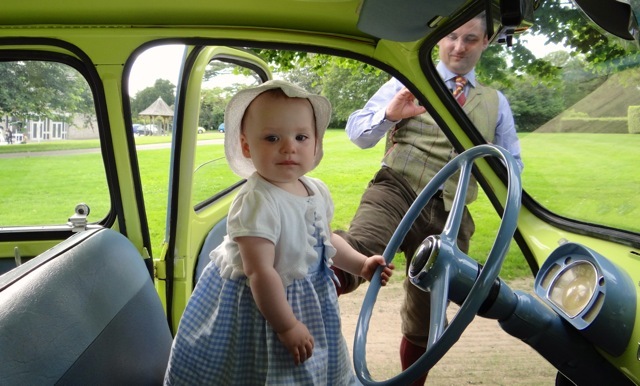 Some people are just very inconsiderate of classic vehicles on the road and are the main reason we avoid using busy roads and try to keep to the country routes where we can. 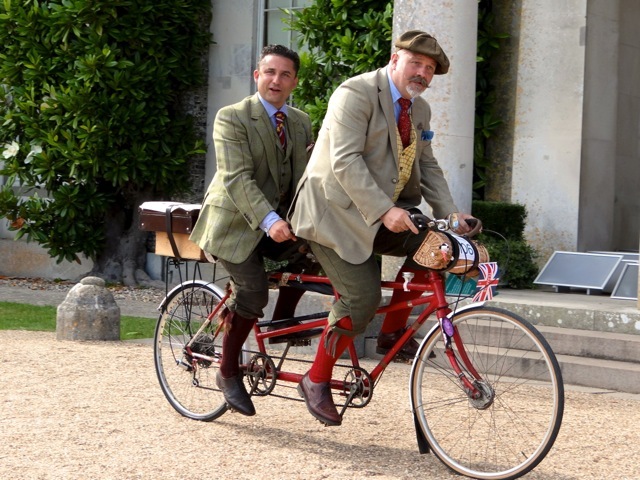 I just wish we had been heading into Midhurst where we know a great shortcut which would have allowed us to ‘reappear’ in front further up the road, now that would really have p***ed them off! 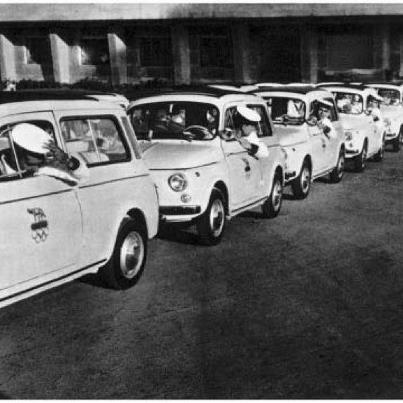 Fiat provided ten 600D Multiplas to be used by the athletes and officials in Rome for the 1960 Olympics. 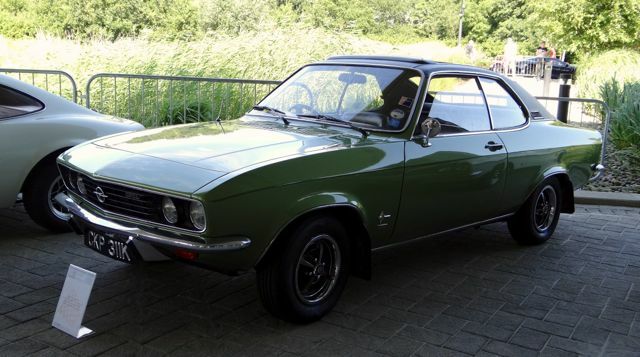 Backed by CocaCola this example is supposedly one of the ten and was in auction at Coys, Monte Carlo in May 2008 where it was unsold and then at the Nurburgring auction in September 2008 where it sold for the rather low price of €12,500. 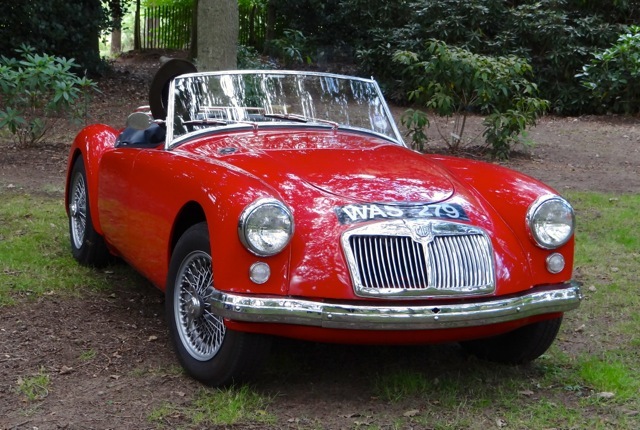 It was listed as a 1957 example, 3 years before the Olympics so maybe it was a reproduction, the wire wheels don’t look original. 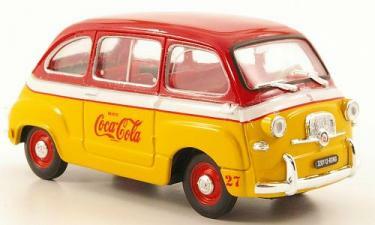 There are several models available which show this yellow and red Coca-Cola design but they are called ‘sound’ trucks. 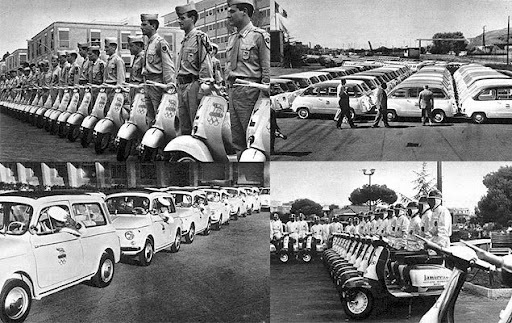 Unfortunately I can’t seem to find any images of the Multipla’s in use at the event, although there are some of other Fiats (500 and Giardinere) and Lambretta scooters. 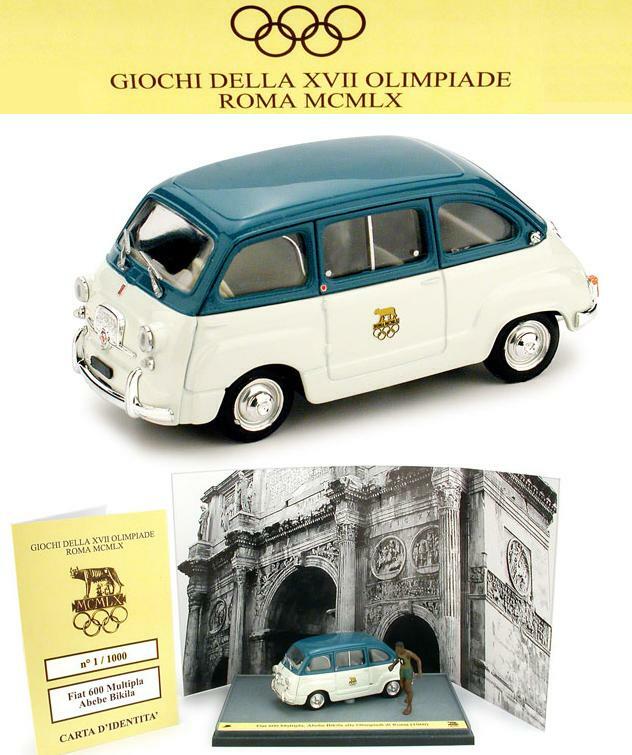 In the top right image you can actually see the Multipla’s supplied by Fiat in two-tone with the Rome Olympic symbol on the door, we then found an image of another model which backed this up. 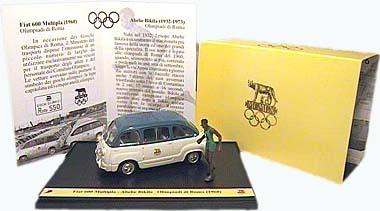 The pack for the model has a leaflet with it with text in italian, it may give more information or may just be about Abebe Bikila the Gold medal winning marathon runner whose model appears with the Multipla. 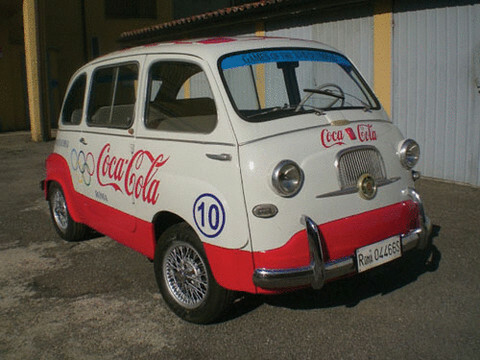 This two-tone car is obviously the official Fiat supplied Olympic car while the other may have been used by Coca-cola who sponsored the event and handed out drinks and a music 45rpm single to athletes – so the red and yellow ‘sound’ truck could have been used as a promotional vehicle handing out the singles? Will keep you posted.